When I pulled my car into the Military Museum grounds on Tuesday for the Boalsburg Farmers' Market, a man directed me to overflow parking. This was definitely a first. I've been coming to the market for six years, and while attendance has steadily grown, Tuesday attracted a record crowd. Much of that had to do with the third annual Boalsburg Farmers' Market Golden Basket Chefs Competition, for which I was happily one of the judges. If a thriving food culture is one of the pillars of a strong community, Tuesday's market said a lot about the vitality of central Pennsylvania. As the participating chefs diced, sautéed, and plated, food lovers mingled, shopped, gave interviews, and networked. Representatives of the Appalachian Regional Commission, a federal-state partnership focused on sustainable community and economic development, even made the market a stop on a regional tour of local food systems. Everywhere I turned, people talked food. At the chefs' cooking stations, Jamie Steffen of the Nittany Lion Inn sliced a hunk of Stone Meadow Farm's Taleggio cheese, while self-professed foodie and longtime State College resident Nancy Anderson suggested grilling it in stacks with eggplant, tomato and basil. Anderson attributed the record turnout to a rising consumer consciousness about the choices we make around the dinner table. "We're all chasing the same thing," she remarked. "We want to live well." The very idea of the Chefs Competition was to showcase just how much is available at the market, particularly this time of year. The market could easily replace a trip to the grocery store, providing just about everything (ok, not the olive oil) you need for dinner. And if you needed inspiration, there was plenty served up by the participating chefs. Part of Pennsylvania Association for Sustainable Agriculture's "Local Foods Week," the event had chefs preparing a main dish and two sides from ingredients produced by Boalsburg Farmers' Market vendors. The chefs attended the previous week's market to get ideas and place their orders. During the judging most of the chefs remarked that more than 90 percent of their ingredients came from the market. 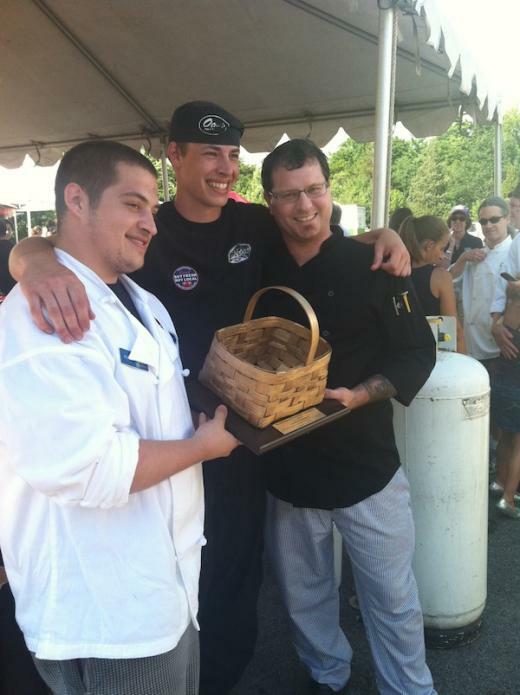 Team Otto's, which clearly seemed to be having the most fun, took top prize for a dish that featured chicken roulades (the meat is pounded, stuffed and rolled) with morel mushrooms, spicy goat cheese, shallots, and ciabatta bread. A reduction of red plum and sugar gave the dish a hint of summer sweetness. The beautiful, heaping entrée, which included a side of grilled vegetables and a tri-color potato salad, made me think of the great feast surrounding the Ghost of Christmas Present. While Team Otto's (Steve Spanelli, Jake Bahr and Alex Guralnick) walked away with top prize, the market vendors deserve their own accolades. The winning dish featured ingredients from Cow-a-Hen Farm, Patchwork Farm, Clan Stewart Farm, Gemelli Bakers, Way Fruit Farm, Byler Goat Dairy, Ardry Farm, The Piper's Peck, and Otto's own garden. As I forced myself to make room for another bite, I felt giddy with food. "You all are the lucky ones today," Brian Snyder, executive director of PASA remarked as he walked by the judges table. Lucky indeed. And, like most days I leave that market, happily stuffed. If you missed the market or if the chefs' samples have you craving more, the Second Annual Boalsburg Farmers Market "Plow to Plate" Harvest Dinner on Sept. 11 is a repeat of the same principle — only this time you'll get a full meal. The event, held at Mt. Nittany Winery, features dishes prepared by local chefs with ingredients obtained at the market. Tickets can be purchased at Webster's or at the Boalsburg Farmers' Market. 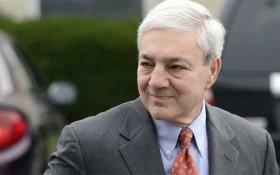 There's been another legal filing in connection with the lawsuit filed by former Penn State president Graham Spanier against former FBI Director Louis Freeh. In July, Spanier's attorneys filed legal documents notifying Freeh that Spanier plans to sue him for defamation and will be seeking monetary damages.